$42 Value! 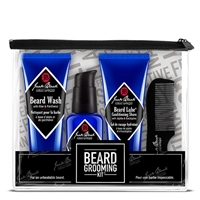 The Jack Black Beard Grooming Kit is the perfect kit for all types of facial hair. 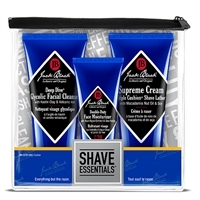 This four-step grooming routine helps to cleanse, condition, and soften facial hair and skin. Great for travel! $43.50 Value! One of each: Classic Strong Mint, Aquatic Mint, Jasmine Mint, Ginger Mint, Whitening Mint, Cinnamon Mint, and Licorice. $57 Value! 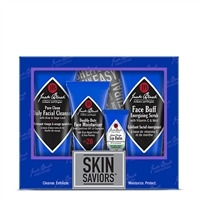 Jack Black Skin Saviors Set delivers a full skincare regimen in TSA-approved sizes to cleanse, exfoliate, moisturize, and protect your skin. Great as a gift. Simply add Gift Certificate to Shopping Cart. You will be able to specify the amount and delivery method (by email or by mail). $81 Value! Everything you need for everywhere you go in convenient, TSA-approved travel sizes. Packed in a premium waxed cotton canvas dopp kit. $47 Value! Cleanse, refresh, hydrate and protect with a multifunctional set that includes a clay-based cleanser, a daily moisturizer with sunscreen, and a shaving cream. $63 Value! Features TSA-approved essentials to ensure your regimen doesn't suffer on the road. Packed in a premium waxed cotton canvas dopp kit. $72 Value! Hit the gym with everything you need � and nothing you don�t � to help you rejuvenate post workout and get back to the grind in no time. Includes deluxe black netted sponge that creates rich lather and gently exfoliates.